Personal Lea: Boo! What's New? Can you believe that the Halloween stuff is already out in all of the stores! It seems like just yesterday we were putting the holiday stuff away and here we are gearing up for another season! So . 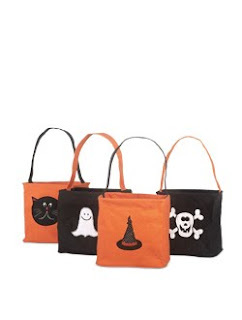 . . we have some adorable new Halloween totes this year - there are other stores that sell them, or similar items, however we include free monogramming! Check it out - oh, and did we mention that we have glow in the dark thread? It is so very cool! When we first tried it we were expecting just a subtle glow but no, you could light your way with this thread it is so bright! We are also gearing up for the holiday gift giving with some new items. 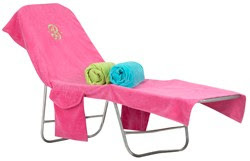 Check out the terry towel lounge chair covers - they are so cozy and they have these handy pockets on the sides - as soon as I saw them I just had to have them - they are perfect for that gal who just has everything - maybe even a unique teacher gift! Of course, they can be monogrammed! Have any good ideas for us? Is there something you've always wanted us to carry? Email us and let us know ASAP so we can get busy! Also, plan on visiting us at the Saint Michael's Fall bazaar November 12th and 13th - we will have some exclusive items there and a whole new line of hair bows that you will absolutely love! And maybe, just maybe, a few surprises!! !